‘The USIP is now in its 13th year and I’m elated to say that 422 interns participated in the programme to date, with 82 of them now working permanently for the City. The first of February is a big day for our new group of interns. They will be placed at different City departments where they will have access to and learn from some of the best professionals in our country. This is a once-in-a-lifetime opportunity and I’m urging these young graduates to make use of every minute to learn and to gain experience,’ said the City’s Mayoral Committee Member for Corporate Services, Councillor Sharon Cottle. Image (above): Cllr Sharon Cottle, the City’s Mayoral Committee Member for Corporate Services, urged the Class of 2018 to use the skills they acquired during their 12-month internship with the City. Councillor Cottle spoke at the award ceremony that took place on Friday, 24 January 2019, where some of the 49 new interns for 2019 were welcomed as well. The City is funding the interns’ stipends, capacity-building training programme, recruitment and induction. The majority of the interns will be placed within the scarce skills categories such as economics, engineering, environment, heritage, renewable energy, urban design, landscaping, planning, surveying and architecture. ‘It’s important to promote the scarce skills study fields to young people as these skills are in demand. Finding employment is a challenge in the current economic climate and gaining experience in scarce skills will make it significantly easier for them. It’s also a great return on investment for the City which needs their skills and youthful enthusiasm within our ranks where they can assist us in becoming a more efficient and resilient administration,’ said Councillor Cottle. Each intern is placed with a specific manager who manages, mentors, guides and assists them. ‘The interns may be highly qualified in a specific field, but are typically fresh out of university and often lack practical workplace skills and experience. The interns are assigned specific tasks to ensure job-related training and we have, over the past 13 years, built up an excellent reputation. In fact, companies and organisations consistently confirm how impressed they are with those interns who have completed the internship programme with us,’ said Councillor Cottle. Interns are recruited through advertisements on the City’s website and in newspapers, as well as at universities. The City receives on average between 2 000 and 4 000 applications each year. An initial assessment is undertaken to select the top 200 potential candidates for interviews, and the successful candidates are then offered an internship with the City. ‘Almost 70% of those who complete their internships find employment afterwards, with about 20% being permanently placed at the City. These figures are testimony of the quality of our internship programme. Most of us remember our very first job, and sometimes our first day working for our own salary. We remember the pride and independence, and immense freedom that comes with being able to earn your own way. The internship provides learners with a quality work experience where they have access to some of the best professionals in this country. The skillset that they develop during this period is a solid foundation for their future careers,’ said Councillor Cottle. At the end of the 12-month programme, all interns and some of the new intake of interns attend an award ceremony where the outstanding interns are recognised. ‘We honoured the Class of 2018 on 24 January 2018. I mentioned the importance of on-the-job training at this function, and said that we need more sponsorships from corporates and for other organisations to partner with us to keep this programme going. I’m looking forward to hearing from the private sector – send me an email, or phone me. We need you to partner with us and to invest in the future of Cape Town’s young graduates,’ said Councillor Cottle. 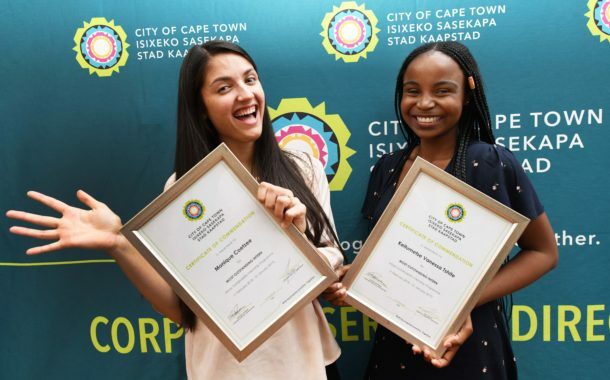 Image (above): Monique Coetzee and Keitumetse Vanessa Tshite were the outstanding interns for 2018.